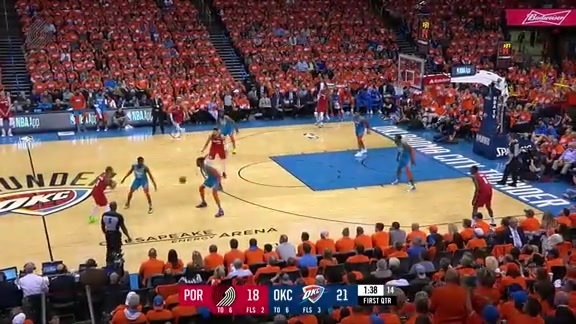 PORTLAND -- There is some debate regarding whether or not Thunder coach Billie Donovan actually said “can’t play Kanter” when the Turkish center was a reserve for Oklahoma City during their first-round loss to the Houston Rockets back in the 2017 NBA Playoffs. Kanter said Donovan told him he didn’t say the words, or at least not in the spirit of which it was intended, and that he believes his former coach wouldn’t lie to him. 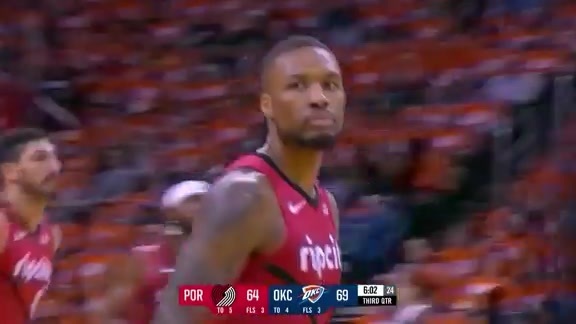 But on this, there can be no debate: the Trail Blazers could not have taken Game One versus the Thunder Sunday afternoon at the Moda Center without the play of Enes Kanter. The 6-11 center in his eighth season out of Kentucky, signed midseason as a free agent after he was bought out by the Knicks and thrust into a starting role after the season-ending injury to Jusuf Nurkic, finished with 20 points, 18 rebounds, two blocks and a steal to finish a game-best +16 in Portland’s 104-99 victory at the Moda Center. “Any time you’re going up against a team you’ve played for... you’re going to want to play well," said Trail Blazers point guard Damian Lillard, who helped recruit Kanter to Portland. "You’re going to want to come up on the winning side. 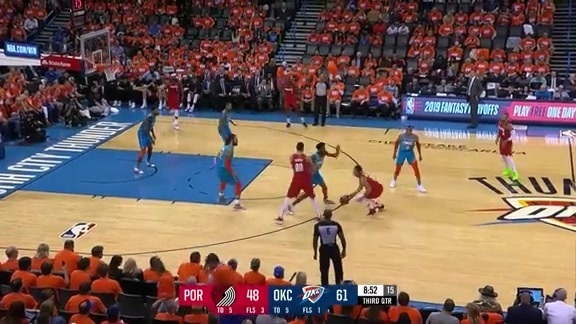 So I think we understood that (Kanter) was going to come out ready to play just off of that alone, but he was the MVP of the game, especially down the stretch getting us second opportunities, third opportunities. He had a huge presence down the stretch and played a huge part in us winning this game." Donovan might not have said "can't play Kanter," but he certainly looked to attack him on the defensive end early and often in Game One. Between pick and rolls and post ups, Thunder center Steven Adams, a close friend of Kanter from their days together in Oklahoma City, scored 11 points on 5-of-6 shooting from the field in the first quarter with Kanter defending. “I think defense is all about communication for us," said Kanter. "I think we did a very good job communicating on the pick and rolls and trusting each other. I know every time I got beat or somebody else got beat, my teammates have got my back and I’ve got their back." And while he wasn't able to match Adams' scoring in the first 12 minutes, he did grab eight rebounds, which was only one fewer than the Thunder pulled down as a team in the first quarter. Despite the fatigue that comes along with battling the likes of Adams, Kanter seemed to get stronger as the game went on. He came up with two crucial offensive rebounds to stave off an Oklahoma City run in the fourth quarter and matched is first-half scoring output while grabbing eight rebounds, four of those offensive, to finish the game with the third playoff double-double of his career. “We just gave him the ball and let him make his own decisions; when to pass, when to shoot, playing strong around the basket," said CJ McCollum. 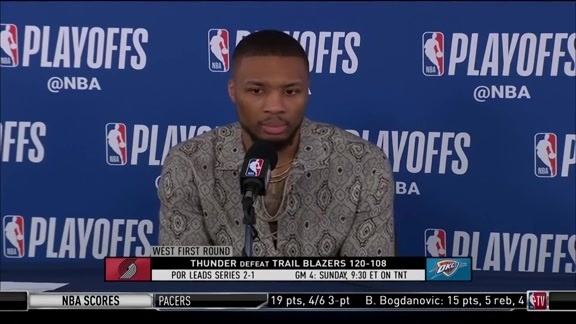 "He was plus-15, he rebounded the ball, he used his left hand tonight a couple of times, so I was really impressed with the strong step and the high left-hand finish down the stretch of the game. We need every rebound, we need every point and I think that he knew that regardless of playing against his former team." He also played a primary role in holding Adams to four points and three rebounds on the second half. He may never be one of the top defensive centers in the league, but he more than held his own Sunday afternoon. "I think it’s unfortunate a lot of times you get a reputation and the reputation kind of sticks with you whether you deserve it or not," said Trail Blazers head coach Terry Stotts. "I think Enes has really been good for us defensively. He gives great effort. He wants to do what we want to do. One on one against Steven Adams, he can hold his own on the block. Pick and roll defense, he gives good effort, he’s communicating so as a coach all you can ask for is that a player is giving effort, trying to do what you want him to do. Enes has been like that from day one with us." Kanter is one of just three players in franchise history to finish a playoff game with at least 20 points and 18 rebounds -- Bill Walton and LaMarcus Aldridge are the other two -- so it's probably not reasonable to expect a similar performance in Game Two Tuesday night at the Moda Center. The Thunder will look for ways to slow him down offensive and are likely to put him into more pick and roll action in order to take advantage of Adams' quickness and Russell Westbrook's athleticism, but if he brings the same effort, enthusiasm and energy, they're chances of heading to Oklahoma City with a two-game lead in the series improves considerably. "We can’t worry about (Oklahoma City’s) misses or makes," said Kanter. "I think everybody did a good job contesting the shots. We just won Game One, we didn’t finish the job, we only won one game. We can’t be too happy, if we lose, we can’t be too sad. We’ve got to go out there to the second game with the same mindset and play tougher and play more physical."